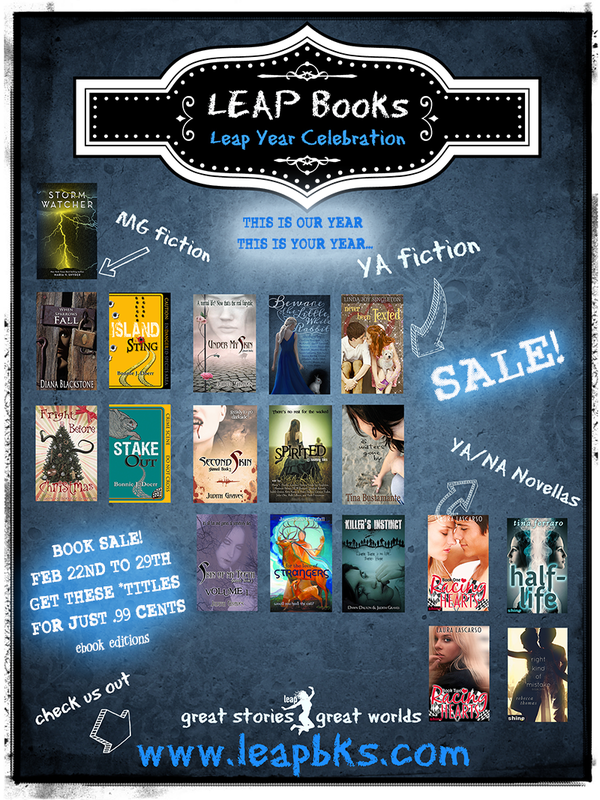 Not our usual fare of books on the blog - but I just had to share this great 99cent sale going on through the end of the month! Leap Books is celebrating the Leap Year with a special once in four year sale, putting a huge selection of amazing books on sale for just 99cents from February 22nd through February 29th. Enjoy the extra day this year with some new books! Storm Watcher by Maria Snyder – Luke Riley is lost after losing his mother to a storm. With his new friend Willajean, he stuggles through a summer of stubborn fathers, storms, unhelpful siblings, and hidden guilt. When Sparrows Fall by Diana Blackstone - When Susanna’s discovery of a strange nighttime visitor at her mysterious neighbor’s home leads to the unveiling of secrets, Susanna is forced to make a choice between her conscience and her Mennonite community. Under My Skin by Judith Graves - All her parents wanted was for Eryn to live a normal life… A normal life? Now that’s the real fairytale. Second Skin by Judith Graves - What happens when you’re both the beauty and the beast? Beware the Little White Rabbit Anthology - Come Celebrate the 150th Anniversary of Lewis Carroll’s classic, ALICE’S ADVENTURES IN WONDERLAND. Join Leap Books on this curious exploration of madness, tea parties, Cheshire grins, moments of terror, fantastical settings, romance, and, mayhem! Our select group of talented authors are united by their passion for all things Alice and will delight you with their take on what really happened down the rabbit hole. Spirited Anthology - Leap Books summoned best-selling paranormal and dreadfully talented debut authors to conjure up Spirited, a haunting collection of 13 tales guaranteed to keep you up all night. For the Love of Strangers by Jaqueline Horsfall - What if you discovered your birth fulfilled an ancient prophecy? What if you were destined to save an entire wild species? Would you heed the call? Never Been Texted by Linda Joy Singleton - Though Ashlee knows not all stories end happily, she’s determined to make hers the best it can be. As Waters Gone By by Tina Bustamante - Can Ellie gain the courage to uncover the truth of who she really is and finally find a place where she belongs, or will she choose to remain an outsider? Killer’s Instinct by Dawn Dalton & Judith Graves - Where there is no life – there’s HOPE. Racing Hearts Book One by Laura Lascarso - He wants to honor his father’s legacy; she wants to prove her father wrong. Racing Hearts Book Two by Laura Lascarso - Can these two competitors overcome the sins of their fathers or will a shadowed history destroy their dreams forever? Half-Life by Tina Ferraro - Probably not a good idea to take advice from your dead twin sister. Right Kind of Mistake by Rebecca Thomas - Heartbroken, Haylie is only looking for a few hours of pure bliss. But hockey hero Cam wants more than a hook-up. His goal? Ice-melting romance.